All photos courtesy of Paul Lamos from the archives of his stepfather, and former MWPT packer, - Bill Smart. The packers life is, without a doubt, one of the best there is. 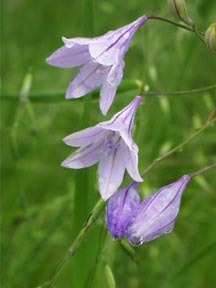 It is too bad that here in the west that that life is confined to the summer. When winter sets in, so does the snow and everyone goes back to some "fall back" job - school for the students and saddlery or something else for the non-students. It seems that no matter what the job at the pack outfit it is always exciting; and, something which you yearn to do. 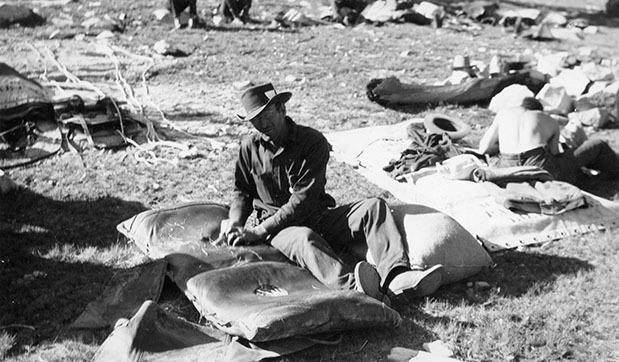 It might be the toughest job that you've ever done in your life - shoeing stock, wrangling, packing up camp, loose herding stock or driving stock trucks - but for some strange romantic reason seldom does a packer not wish to return the following summer. 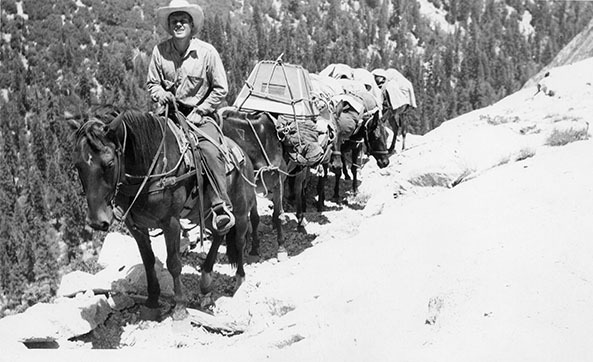 Charley Gilmore on the trail. 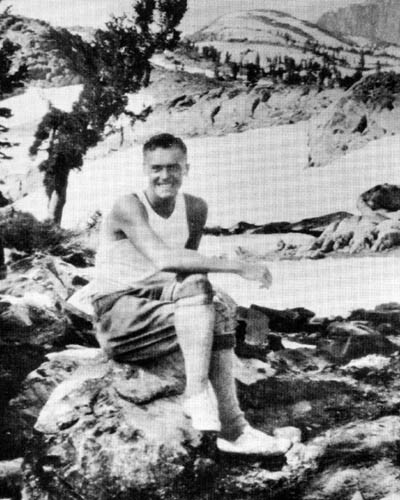 Somewhere in the backcountry Charley Gilmore seems to be having quite a time. What the heck is that load on your first mule Charley? 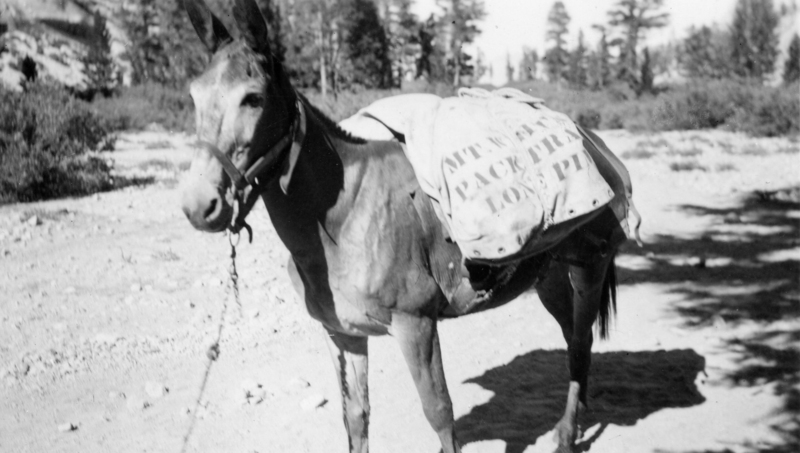 From lumber to hay, 225 pound stoves to every conceivable configuration of pot and pan, dunnage to dynamite and sides of beef to fresh watermelons and cantaloupes; anything that could be packed, the packer would find a resourceful way to not only get on his mule but somehow get the load balanced and tied down with that famous Mt. Whitney Packers diamond hitch. Let's not forget that a well tied down load in the morning is no guarantee that it will last the entire day! The "best tie loads of mice and packers" often loosened up with the heat of the mule and the day. It always paid to check those loads throughout the day. 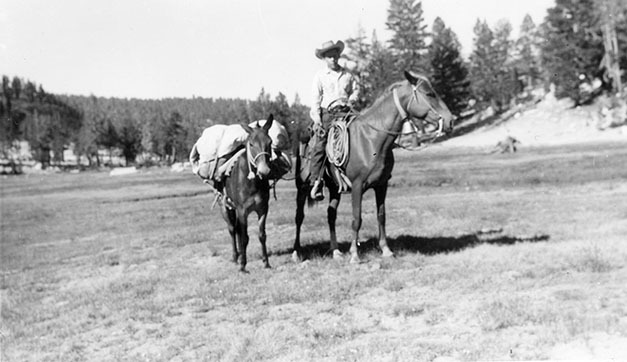 I remember once, while pushing stock 15 miles from the mountain corrals of Whitney Portals down to the desert corrals of the Elder Ranch, I neglected to cinch up the saddle on my horse sufficiently and about one mile down the road, after the horse had worked up a sufficient sweat, off slipped the saddle and me! What an utterly embarrassing moment! By the time I caught my horse and got resaddled the other packers and stock were a half mile ahead of me and Irene, Tommy and Barbara got the laugh of the morning! The Club commissary seemed to always be the focal point for exciting conversation, social happenings, and an opportunity to "get on the good side" of both the cooks and the commissary girls. Those cooks were always the best! Was it all of the fresh food they had to work with, the aura of the Sierra Nevada or the adventurous people they "catered" to? Whatever it was, it always kept you coming back for more. I recall one high trip trip when Bob Golden was cook. We were camped in Lower Rock Creek and Bob was cooking up some fantastic steaks. One of the packers, Ed Brown, told him to throw a steak on the stove for him and make sure it was well done. Ed didn't come back to get that steak for about 45 minutes! I swear, Ed must have just been eating a piece of charcoal. L to R: Need some help from you Club members to identify these folks! 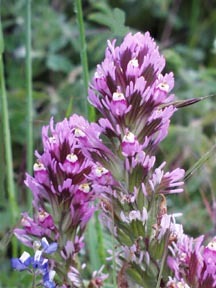 Located just south of Garnet and Nydiver Lakes, with the Minarets to the southwest and Mt. Ritter and Banner Peak to the northwest is majestic Ediza Lake. Fed by the overflow from Celie and Iceberg Lakes, Ediza Lake gives rise to Shadow Creek at its terminus. 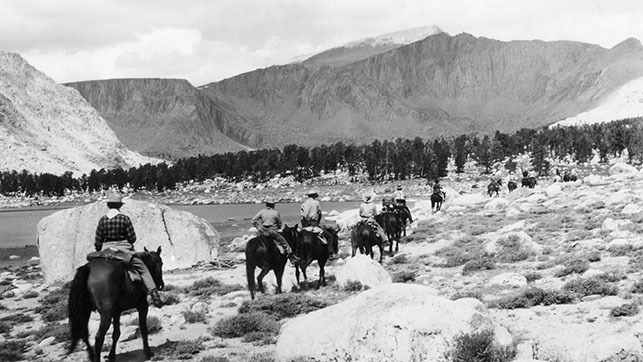 To the east are Deadman Pass and Agnew Passes. 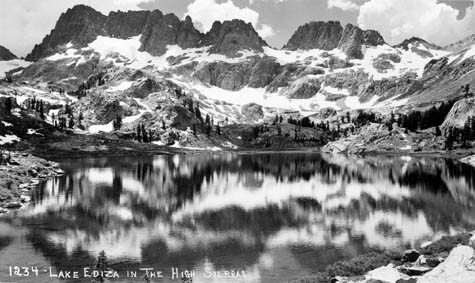 The Minarets, as seen in this picture of Ediza Lake, are the presumed burial place of famed mountaineer, trail blazer, and Sierra Club advocate - Walter A. Starr, Jr. I have many a fond memory of packer's camp. Perhaps the most exciting was on a Sierra Club Family trip out of Twin Lakes. 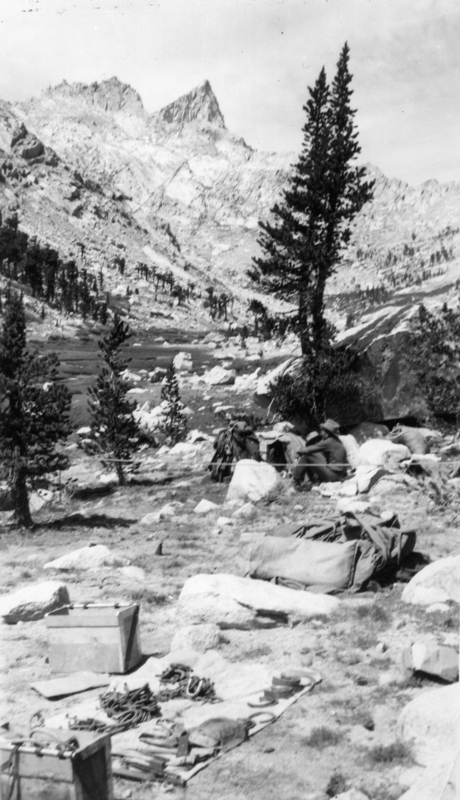 It was one of those trips where we three-wayed cache, pushing food ahead to both the next and the last camps. 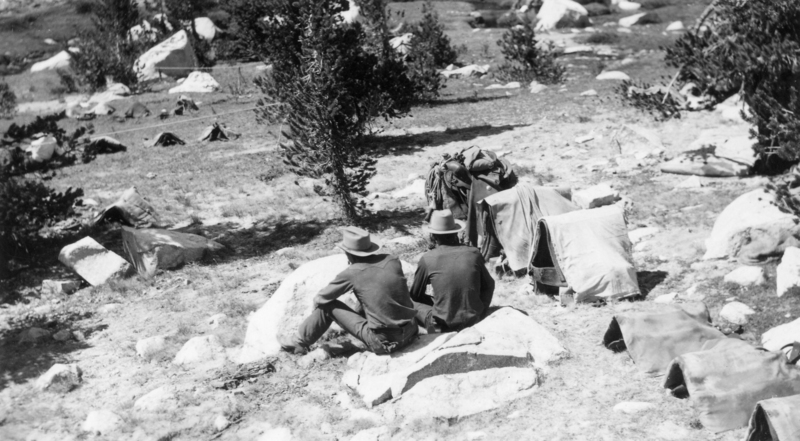 The last camp was located in Kerrick Meadows between Paiute Mountain and Price Peak in Northern Yosemite, and the Sierra Club was supposed to have a "bear guard" stationed at the intended camp. Well, you guessed it!, there was no bear guard and by the time we arrived at the last camp, eight days later, there was very little food the bears did not get into. This called for quick action if on the part of Norman Jefferson and myself. We quickly went out and caught ourselves some trout. 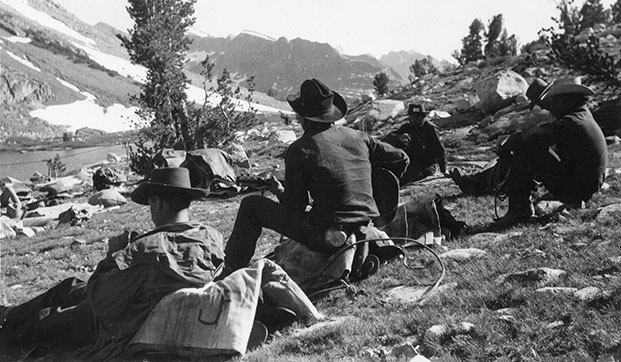 As soon as the rest of the packers left camp for the Sierra Club commissary we hastily cooked up the trout and were licking our fingers when they finally arrived back at packer's camp. You can't believe how good that trout tasted and how mad the rest of the packers were. We did make it up to them the following day with a catch to feed everyone. Tommy Jefferson serenading the packers in packer's camp. Mt. 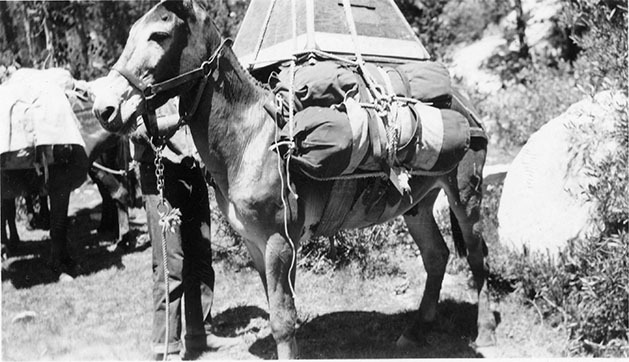 Whitney Pack Trails mule all packed up and eager to hit the trail.